Jay Solomon and Carol E. Lee reported on the Obama Administration’s hypocrisy in the Wall Street Journal. The money represented the first installment of a $1.7 billion settlement the Obama administration reached with Iran to resolve a decades-old dispute over a failed arms deal signed just before the 1979 fall of Iran’s last monarch, Shah Mohammad Reza Pahlavi. The settlement, which resolved claims before an international tribunal in The Hague, also coincided with the formal implementation that same weekend of the landmark nuclear agreement reached between Tehran, the U.S. and other global powers the summer before. 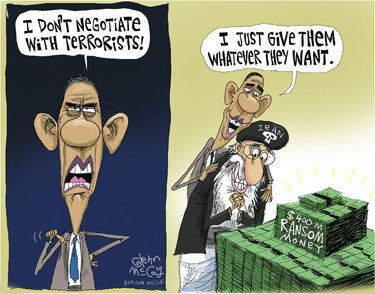 “With the nuclear deal done, prisoners released, the time was right to resolve this dispute as well,” President Barack Obama said at the White House on Jan. 17—without disclosing the $400 million cash payment. Senior U.S. officials denied any link between the payment and the prisoner exchange. They say the way the various strands came together simultaneously was coincidental, not the result of any quid pro quo. But U.S. officials also acknowledge that Iranian negotiators on the prisoner exchange said they wanted the cash to show they had gained something tangible. “This break with longstanding U.S. policy put a price on the head of Americans, and has led Iran to continue its illegal seizures” of Americans, he said. Since the cash shipment, the intelligence arm of the Revolutionary Guard has arrested two more Iranian-Americans. Tehran has also detained dual-nationals from France, Canada and the U.K. in recent months. One Feedback on "Still a Ransom, Even If You Call It Something Else"
If we have reached the point where the surreptitious delivery of $400 million in foreign currencies to a terrorist regime as a ransom payment doesn’t trigger widespread outrage among citizens, then we are well and truly screwed. This episode can only embolden our nation’s enemies to commit further depredations, probably timed for the period immediately after the November elections, when they know that the always irresolute Obama will be contemplating his imminent departure from the White House for a lifetime of taxpayer funded golf outings.